We love showing our dogs, which we do regularly, and have enjoyed success in many shows around the country, including of course, the one that everybody knows - Crufts. But that's not the whole story. Puppies that we've bred have gone on to enjoy success in Trials, Obedience, and Agility as well as the show ring. Pictured below is Vimick Low Flyer at Mastercut C.D.EX, Working C. in obedience only. 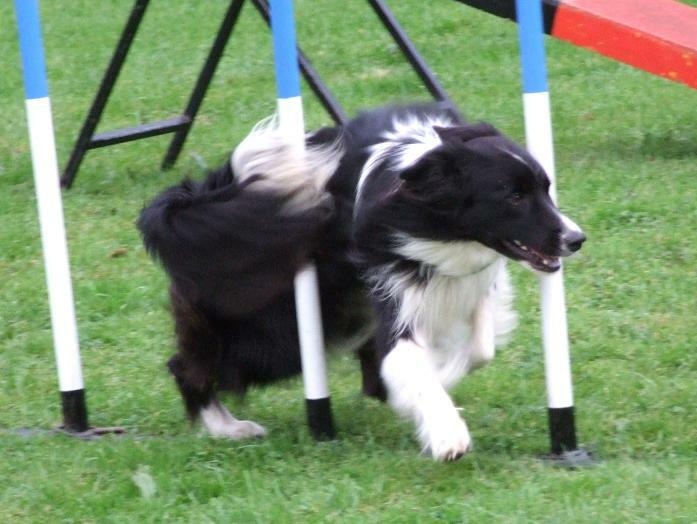 Vimick Talk Later Speak a Lot (known as Diesel to his owner Debbie Eales and the rest of his family) is 4 years old and loves agility events. 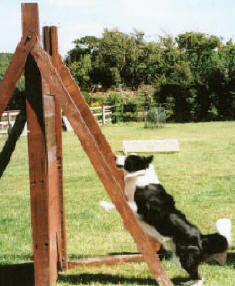 Not only is he a beautiful and much-loved family pet, but he has also achieved a great deal of success in agility competitions. Vimick Talk Later Speak a Lot (Diesel) in action at an agility event (left) and relaxing with his rosettes (right). We are also extremely proud of Vimick Renaissance at Fenborders (Jess), another obedience and agility dog who has recently achieved great success. 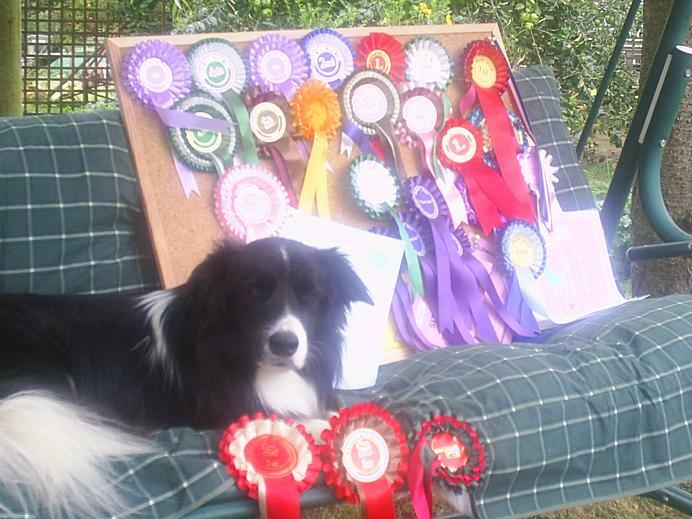 Just eight months after giving birth to a litter of puppies, Jess won Elementary Agility at the Scunthorpe Obedience and Agility Training Club's Agility Competition. On the first day (05.08.06), Jess gained second place in 27.17 seconds. On the second day (06.08.06), she achieved first place in a superb 26.67 seconds. 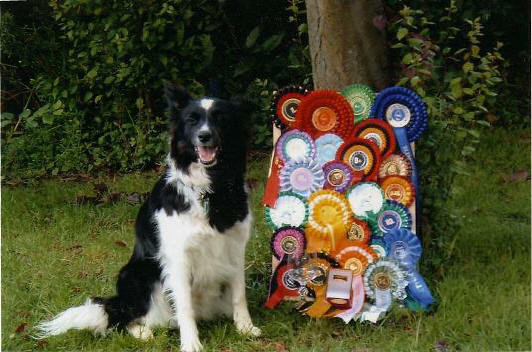 In May 2007, Vimick Renaissance at Fenborders (Jess) won out of Grade 2 into Grade 3 at Godmanchester Agility show, under the watchful eye of judge Shirley Wells. Jess and handler/owner Teri Dimbleby beat 175 other dogs in the class in a time of 30.744 seconds in 'very' wet conditions, having won out of Grade 1 only 7 KC Agility shows earlier. Jess gained another place rosette and two other clear rounds that weekend. She had also passed her Silver Good Citizen test earlier in the same week. Jess and Teri have a busy schedule of competitions throughout the coming summer months. Teri is also looking forward to handling Fenborders Northern Lights (Welly) in agility competitions from the middle of June, when he is old enough to compete. Welly (Sire Vimick Walks Without Sound, Dam Vimick Renaissance at Fenborders) has been learning to control his enthusiasm for agility since turning a year old and is raring to go! He enjoys working obedience with his mum and passed his Bronze Good Citizen test before he turned 8-months old. He is looking forward to taking his Silver test very soon. Good luck Welly! Another achievement of which we are extremely proud, and which demonstrates the beautiful temperament of our dogs, is the use of some of our puppies as P.A.T dogs (Pets As Therapy). 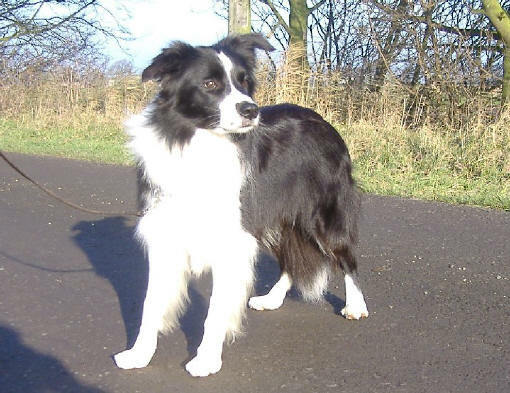 One person who currently has two P.A.T dogs of our breeding is Karen Scott. Karen and her two collies (Bryn and Heidi) do various work raising money for charity, as well as visiting people in care homes and hospices. These dogs bring great joy and comfort to many people and we are incredibly proud of them. For more information about P.A.T dogs, you can contact Karen on: rach@Kdr-home.fsnet.co.uk or see the Pets As Therapy website. Another dog that we have bred has gone on to achieve great success in her home country of France. 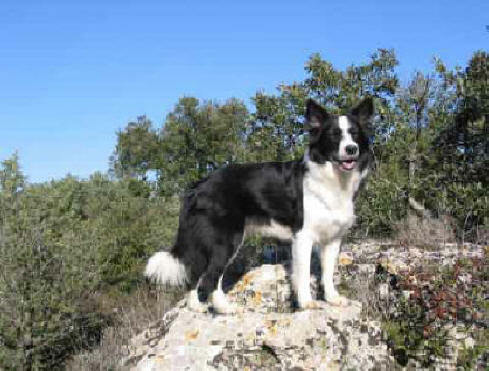 Vimick New Moon (Lucy) has achieved recognition by the French Kennel Club (Societe Centrale Canine) as a working Border Collie; a status that is granted only when a dog has undergone a rigorous assessment and proven that she has the skills required of a true working dog. However, not content with proving that she is an intelligent dog, Lucy has since gone on to prove that she has beauty as well as brains, by winning a Societe Centrale Canine breed show, and being rated by the judges as "Excellent". 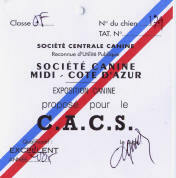 Lucy's Southern French Regional Champion certificate. Since winning the Societe Centrale Canine breed show, Lucy has become Southern French Regional Champion, and will soon be competing for the French National championship. Good luck Lucy!! 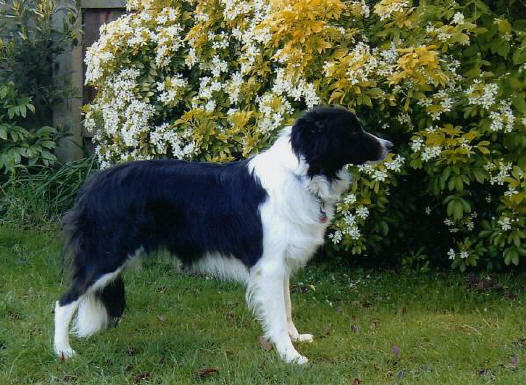 Lucy's owner, Helen, is justifiably proud, and "completely in love with a little black and white Border Collie called Lucy"